During the First World War the city of Lille and the surrounding area was occupied by the German Army. The Germans entered Lille in October 1914 and departed just over four years later in October 1918. This part of northern France was under German military occupation for most of the war. Civilians as well as those in the Armed Forces from this area suffered as well as those in the Armed Forces. On the day the German Army left in 1918 the British Fifth Army, led by General William R. Birdwood, arrived to great acclaim from the citizens of Lille and its environs. Following not long behind was Edward, Prince of Wales, who was to become King Edward VIII for a few months in 1936. After renouncing the British throne in 1936 the Prince of Wales became the Duke of Windsor. After the 1914 - 1918 war, the municipality of Lille organised a competition to design a War Memorial (Monument aux Morts). The municipality wished to commemorate the suffering of all its people during the war - not just those who had served with the Armed Forces. In 1924 the winning submission, given the title 'Melancolia', was submitted by the architect Jacques Alleman and the Lille-born sculptor Edgar-Henri Boutry (1857 - 1938). Originally, 'Melancolia' was planned to have a number of bas-reliefs depicting scenes of some of the more dramatic events of the war in Lille and the surrounding district. However, the city subsequently decided that some of these events would be commemorated by separate memorials in different part of the city. For example, these separate memorials would include one for the nurse Louise de Bettignies who died in a German prison, one for a group of other civilians executed as spies by the Germans and yet another memorial for an 18-year old Belgian, Léon Trulin, executed as a spy in 1915. Therefore, the final design of Lille's War Memorial had three bas-relief.. From top to bottom of the memorial they have the themes of 'Peace', 'Relief' and 'The Prisoners'. In French, these are 'La Paix', 'La Relève' and 'Les Captifs'. The soldiers depicted relieving Lille from its four-year occupation by German forces between 1914 and 1918 in the middle bas-relief are British soldiers. This is an unusual feature for a French war memorial but it represents the liberation of the city in 1918. The Lille War Memorial. 'Melancolia', is located in Place Rihour adjacent to the modern-day Tourist Information Office. It was erected on the site of the old City Hall, which was burnt down in 1916, and was unveiled on 22 May 1927. 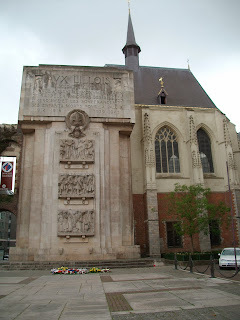 There is a 'Golden Book' ('Livre d'Or') built within the monument beneath the bas-relief containing the names of the Lillois who lost their lives due to war. Since it was originally built, there have been a few additions to it to reflect later wars and conflicts France has been involved with and especially the Second World War. Between 1940 and 1944 Lille and its environs experienced another four-year occupation by German forces. History often has a habit of repeating itself. « Aux Lillois, soldats et civils, la cité a élevé ce monument afin de rappeler au cours des siècles l’héroïsme et les souffrances de ses enfants morts pour la Paix ». "To the people of Lille, soldiers and civilians, the city has erected this monument to remember the centuries of heroism and suffering of her children who died for Peace". Subsequently, the dates 1914 - 1918 and 1939 - 1945 have been added beneath the inscription. In addition, Indo-China and North Africa have been added to remember those who died in those conflicts. 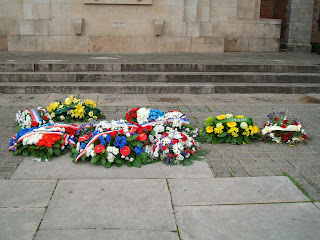 In Place Rihour, in front of the monument, a number of engraved paving stones have been set in place to remember the role of different groups involved in combating the occupiers during the First and Second World Wars, such as various trade groups, trade unions and the 83,000 Polish troops who fell in battle during the liberation of France. Photograph No. 1 (above) shows the Lille War Memorial, 'Melancolia' (May 2013). Each year, on 11 November (anniversary of the Armistice of 1918) and 8 May (anniversary of V.E. 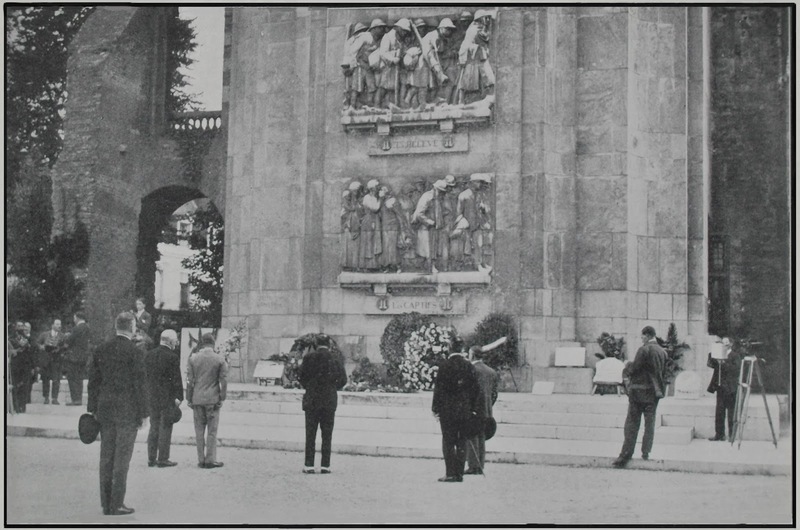 Day in 1945) the citizens of Lille, civic leaders and representatives of regional government gather together in front of the war memorial in remembrance. Photograph No. 2 shows some of the floral tributes that were placed there during the solemn ceremony of 8 May 2013. One of the earliest and largest pilgrimages of the British Legion to France and Flanders took place in August 1928. A year earlier, in 1927, an earlier, pioneering, British Legion pilgrimage to France and Flanders numbered 150. The British Legion Battlefields Pilgrimage of 1928, sometimes referred to as the 'Pilgrimage of Tears', numbered more than 10,000 pilgrims from every part of the British Isles, the Empire and the Commonwealth. Among these 10,000 pilgrims there were some veterans, nurses and chaplains of the 1914 - 1918 war. Others were wives, parents or other relatives of soldiers who had died during the war. They were led by officials from the British Legion. The pilgrim came from all walks of life and were accommodated throughout the Nord Pas-de-Calais and western Flanders. (3) to promote peace and goodwill. (g) a 'March Past' at Ypres ("Wipers"), Belgium and a memorial service at the Menin Gate (Wednesday 8 August). The prince, the pauper, the great, the good, the lowly, the private soldier, the mother, the widow - whatever their standing in life all were united in something that was greater than military discipline. Monsieur Sobry, Burgomaster of Ypres said that the climactic ceremony held in his town was "... an example to the world of organisation, discipline, dignity and piety." Lille was the base for the group of pilgrims from the North-West of England (the traditional counties of Cumberland, Westmorland, Lancashire and Cheshire). The North-West England party of the pilgrimage embarked from Tilbury on the S.S. Alsacien. They disembarked at Dunkirk on Monday 6 August where, at 2.30 p.m., they boarded the train for Lille. Passing the vicinity of Armentières, it is reported that many of the party burst into a favourite wartime song. What else could this song be but "Mademoiselle from Armentières"? It would not be the last time this song would be heard on the pilgrimage! Arriving at Lille railway station (known as Lille-Flandres since 1993) the pilgrims dispersed to their respective billets. Some were billeted in hotels, some in school dormitories and some were guests in private houses. 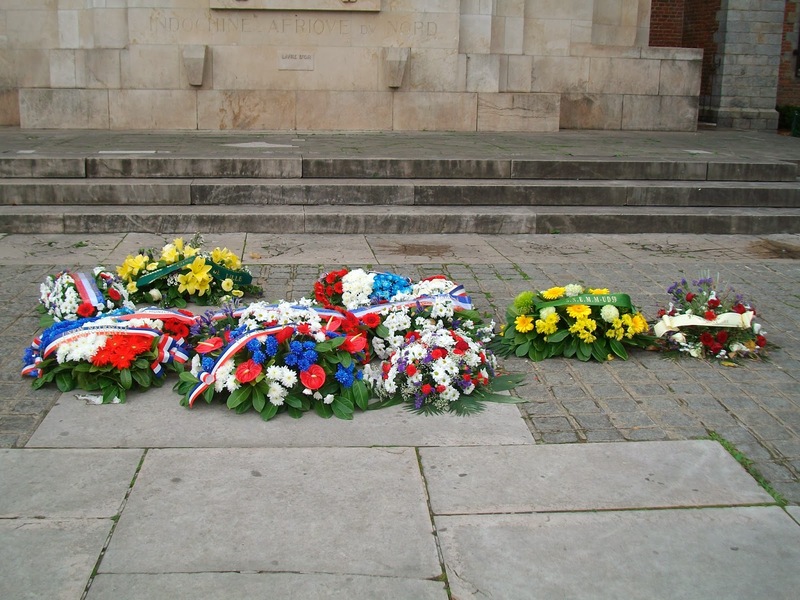 After depositing their baggage, the first official act of the North-West party was to pay homage to the valiant souls of Lille who fell in the 1914 - 1918 war. In front of the Lille War Memorial a short but moving service was conducted by Rev. A.W. Sarson (C. of E.), who had been an Army Chaplain in the war, reading the prayers and pronounced the Blessing. Mr J.R. Gaul of the British Legion North-West Area Council laid a large floral wreath at the foot of the memorial on behalf of all the British pilgrims. The hymn "O, God our help in ages past" and the "National Anthem" ("God Save the King") were sung and the music was provided by the band of the 43rd French Infantry Regiment. There then followed the official welcome at the nearby Lille Opera House where the official welcome was led by the Deputy Mayor of Lille, M. Balavoine and M. Maurice Vincent of the French Ex-Servicemen of Lille, with a reply in French and English by Mr Astbury of the North-West organising party of the British Legion. After dinner at their respective billets, the Battlefield pilgrims, their hosts and other citizens of Lille enjoyed a band concert in honour of the visitors at the Grand' Place (officially renamed the Place du Général de Gaulle after WW2). Many of the Cumbrian ex-servicemen on the pilgrimage headed to one or more of the nearby hostelries where some enthusiastic singing was heard long into the night: ""It's a Long Way to Tipperary"", ""Pack Up Your Troubles in Your Old Kit-Bag, and Smile, Smile, Smile" and especially "Mademoiselle from Armentières". Lille is the capital of the Nord department and where the Prefect is based. Throughout its history, Lille has also often been regarded as part of Flanders and within a short distance of the Belgian frontier and many of the battlefields and war cemeteries of the 1914 - 1918 war. Thus, it was Lille that was the headquarters of the Battlefields Pilgrimage of 1928. H.R.H. Edward, the Prince of Wales, the Patron of the Pilgrimage, was accommodated at Lille in the Prefecture. This was a city the Prince he had visited in 1918 shortly after the city's liberation by British troops. In August 1928 the Prefect of the Nord (North region) was M. Louis Hudelo (1868 - 1945). The Prefect is the Representative of the French Republic which, in certain respects, is equivalent to the Lord Lieutenant of an English county. On Tuesday 7 August 1927 M. Hudelo, together with the Mayor and other noteworthies of Lille and a number of French Generals and Marshals, including Petain, Gouvaud, Weygand and Antoine, officially welcomed the Prince of Wales at the gates of the Prefecture in Lille. Marshal Ferdinand Foch (1851 - 1929), Commander-in-Chief (i.e. "Generalissimo") of the Allied Armies in 1918, had been due to attend but was unable to do so because of ill-health. Marshal Foch's personal representative at the events attended by the Prince of Wales was General Maxime Weygand (1867 - 1965). Following the usual formal introductions at the Prefecture, the Prince, M. Hudelo and the other dignitaries proceeded to the Lille War Memorial which had been unveiled the previous year. Floral tributes in remembrance of the 'Fallen' were laid at the foot of the monument alongside the tribute placed at the memorial the previous day by the North-West British Legion pilgrims. It was a visible sign reuniting and reinforcing the bonds of comradeship between Britain and France that had developed throughout the 1914 - 1918 war. Photograph No. 3 (above) shows H.R.H. the Prince of Wales and others in front of the Lille War Memorial that day. Because of the German occupation of Lille and its environs for most of the 1914 - 1918 war the citizens of the the city had not much contact with British troops until the city was liberated in October 1918. Yet, the Lillois were greatly impressed with the pilgrims based in the city during the pilgrimage and the friendship and respect forged at that time would develop over the coming years. In 1939 and the early part of 1940 some of the B.E.F. were sent to this part of France, many of them from the North-West of England. I think an incident such as this surely proved how impressed the French were. The Pilgrimage has brought the two nations closer together than ever, for it not only expressed but strengthened the friendship of the war." The old fort at Bondues, about 6 miles / 10 Kms to the north of Lille, was built in the latter part of the 19th Century as a garrison to protect the French northern region. During WW1, Fort Bondues was occupied by the German military for four years. For several months in 1940, before the German invasion of Belgium and France, Fort Bondues was the H.Q. for the 5th Battalion (T.A.) The Border Regiment. Then, following the German Occupation of France in 1940 Fort Bondues became a German base for another four-year period. During the summer of 1940, Fort Bondues and the adjacent airstrip was one of the bases for the German aircraft in the Battle of Britain. Later, in 1943 and 1944, it would witness the execution of 68 French Resistance fighters. In honour and remembrance of these executed Resistance fighters, in 1986 the fort became firstly a memorial and then, in 1997, a museum. 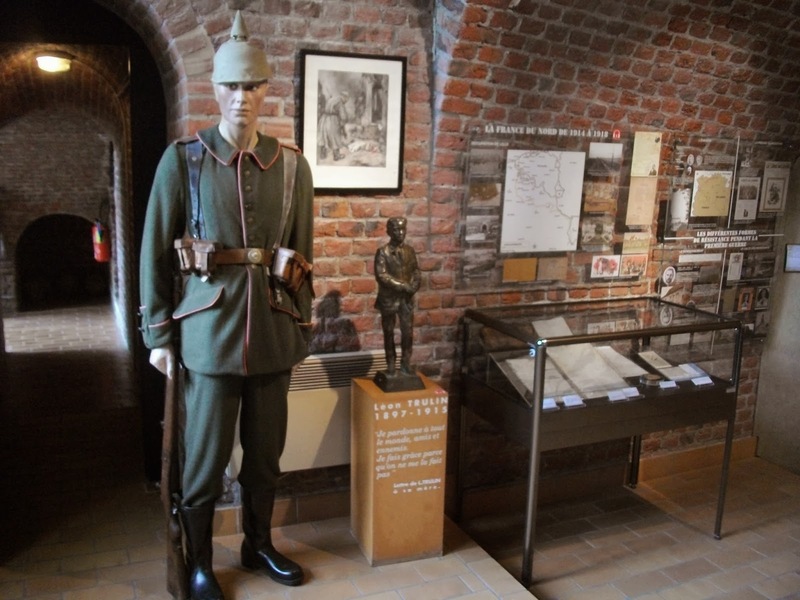 The exhibition of the Bondues Resistance Museum, in French 'Le Musée de la Résistance de Bondues', shows what happened during the German occupation of this part of the 'Nord' department during the First World War, the Second World War. In addition, the museum is a place where one can discover the ideals, sacrifice, actions and daily life of the men and women of the district during the German occupations of the First and Second World Wars. Part of the museum's exhibition can be seen in Photograph No. 4 (above). It shows a model dressed in a German uniform from WW1 and a 'maquette' of the statue of Léon Trulin (1897 - 1915) executed at Lille in 1915 by the Germans at the young age of 18 years. The full-size statue of Léon Trulin, unveiled in 1934, can be found at Lille. The sculptor was Edgar-Henri Boutry - the same sculptor who created Lille's War Memorial (Photograph No. 1). Lille and its environs experienced occupation by an invading German force during both World Wars. In many ways, those years and their aftermath have left a lasting legacy on the region. Gradually, those times are receding into the distant past. Nevertheless, it remains important to remember the past, understand the present and build for a better future. In the early days of the German occupation of the Second World War many of the people of the French 'Nord' department and its neighbouring districts rose to the challenge this new re-occupation of their land. They were following the example of their fellow citizens who had actively opposed the earlier German occupation between 1914 and 1918. This 'resistance' took many forms - including hiding Allied soldiers and airmen who were attempting to evade capture and return to their units, sabotage and the printing of clandestine news sheets. The story of many of these men and women from the North of France who opposed the German occupiers during the two World Wars can be found at the Bondues Resistance Museum. 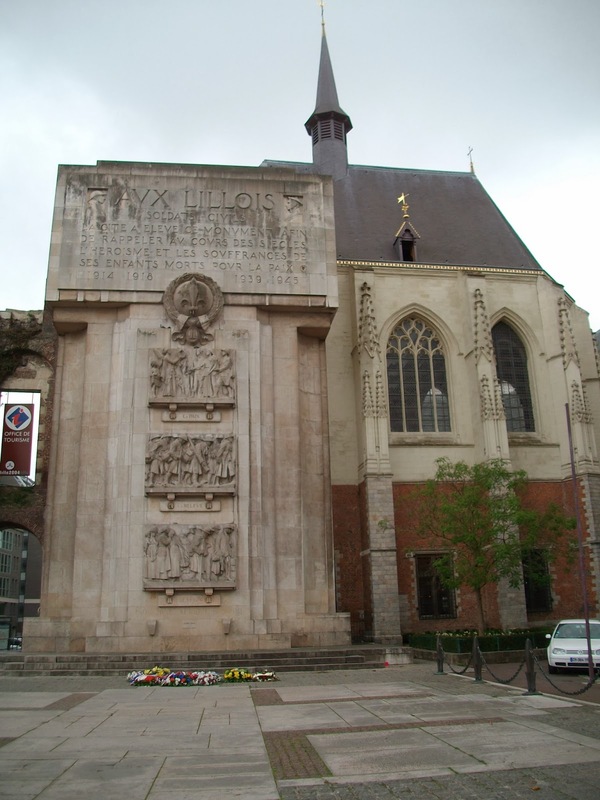 The modern-day pilgrim standing in front of Lille's war memorial or the other war memorials of northern France follows the tradition of the pilgrims who first visited these same locations in the years following the 1914 - 1918 war. Those who died in that war, plus the Second World War and other wars since are still remembered by the Lille War Memorial. It has been a place where the bereaved could be consoled, the dead could be honoured, where comrades could meet together and pay their respects for 'absent friends' and perhaps, above all, a place to remember the terrible cost and sacrifice of war. those who have been bereaved through war. The hymn "O God, Our Help in Ages Past"
The hymn "O God, Our Help in Ages Past", referred to in the article above, is regularly sung at British Legion commemorative services. In the modern era it is usually sung either as a five or six verse hymn (see below). At British Legion ceremonies the fifth of the six verses is usually omitted because of the line "They fly forgotten, as a dream". For the British Legion this is not the case. The dead are not forgotten. The original lyrics of the hymn were by Isaac Watts (1674 - 1748) with some rewording by John Wesley (1703 - 1791). The accompanying music to which it is sung is "St Anne" by William Croft (1678 - 1727). The original words to "Mademoiselle from Armentières", a popular song of the British 'Tommies' of both WW1 and WW2, was written by Harry Carlton and Joe Tunbridge set to a traditional French tune of the French Army. It was first recorded in 1915 by Jack Charman although several, arguably 'racier' variations were sung by the 'Tommies' in the French bars during the two World Wars. The song has also been translated into French and recorded later by several French singers, such as Paola and Line Renaud. From time to time, especially during the lighter moments when groups of British Legion pilgrims visit the war graves of northern France, the song can still be heard in bars and restaurants.